The Indian Met department has issued heavy rain alert on May 19 and 20 in the southern and eastern districts of Karnataka like Bangalore city and rural areas, Chamarajanagar, Kodagu, Chikkaballapur and Hassan. The weather department said the rain could continue till end of the month. Rainfall in the south interior Karnataka has been there since last week, with a rainfall of 6 cm in Uttara Kannada district till 8.30 am on Tuesday. The monsoon precipitation is even sharpened by the impact of the surface winds built in the Tamil Nadu region and low pressure on the Arabian Sea. Chitradurga, Haveri 5 cm each and in Alur, Hassan, Davanagere and Manchikeri each have 4 cm rainfall. Mangaluru in Bangalore is a rainy season. The city received 241 mm rainfall from May 1 to May 15. Warning to Fishermen: Fishermen are warned not to land in the Arabian Sea when the low pressure area is being constructed. 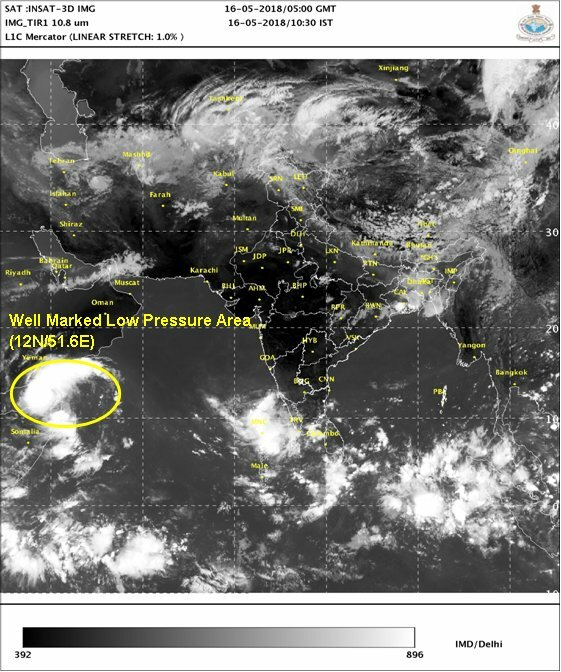 The possibility of a low pressure in the Arabian Sea by Thursday. But there is no danger to the coastal area, the department said. Bangalore recorded a maximum of 32.4 degrees Celsius, a minimum of 20.7 degrees Celsius,Madikeri recorded a maximum of 34 degrees Celsius, a minimum of 25 degrees Celsius, Chikmangalore with a maximum temperature of 35 degrees Celsius and a minimum of 23 degrees Celsius. The temperature dropped slightly to 39.1 degrees Celsius in Kalburgi.